Natalie Fiszer grew up near Chicago, Illinois. Her passion for community service, cultural exchange, and addressing global health disparities led her to complete a degree in International Affairs, with concentrations in international development and global health. While studying at the George Washington University, she had the opportunity to gain practical experience as an intern and volunteer at various organizations, including in the US House of Representatives, Peace Corps’ headquarters, and several local non-profits. She spent a semester in Salvador, Brazil as a Gilman Scholar, studying the Brazilian healthcare system and conducting research on the role of community health workers. Following graduation, Natalie spent two years serving as a Peace Corps Volunteer in the Western Highlands of Guatemala, where she supported educators and health workers in the implementation of a national health education program in rural elementary schools. Natalie then moved to Ecuador, where she worked as a Field Operations Manager for the Foundation for International Medical Relief of Children, managing ten unique health promotion projects in a rural fishing community. Natalie will pursue a Master of Public Health degree, focusing on epidemiology and infectious disease. 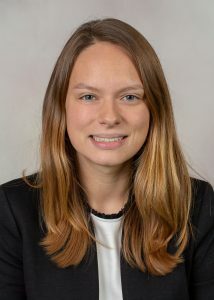 She is eager to complement her global health field experience by gaining technical skills in epidemiological surveillance and disease prevention and control strategies to address public health emergencies. Natalie is excited to begin a career with USAID as a Population/ Health/ Nutrition Officer. Her goal is to always carry her perspective of community driven development in public health, empowering and working alongside local counterparts to create sustainable change. Natalie speaks Polish and Spanish fluently and is working on mastering Portuguese and French. She loves animals and has adopted three cats while living abroad.